Due to heavy traffic, Route 7 is running approximately 14 minutes behind schedule. We will update passengers when Route 7 is back on schedule. A temporary stop will be located on the I-35 service road at the entrance to Lot # 86 at Apogee Stadium. During this temporary reroute, Eagle Point and North Texan, may be unavailable in the Transit Tracker system. When construction is complete and Eagle Point and North Texan returns to its normal route, we will update passengers via Rider Alerts and all social media outlets. We appreciate your patience during this time. 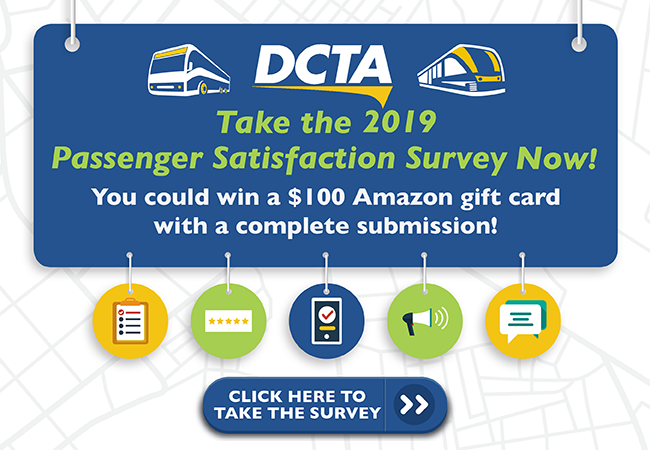 Thank you for riding DCTA! "I love to sit back, relax and look out the window or read a book. I arrive at my destination refreshed and energized rather than exhausted and stressed." The Denton County Transportation Authority (DCTA) provides modern public transportation and mobility options that connect riders with the needs of their day. With fixed-route and on-demand bus service, the A-train commuter rail line and the Rail Trail, DCTA provides a variety of convenient, efficient and sustainable transit solutions for riders connecting to destinations within Denton and Collin counties.